When I was a nipper my brother and I had a tree house nestling in between some ash trees. It wasn’t large but it was exciting – our own home high in the foliage. A bit like this, I’m sure you’ll know the type. I suppose we were inspired by the Ewoks. Fast forward a good twenty years and we live in ‘respectable’ houses. But what if we could live in houses like these guys…? German company Baumraum makes specially tailored tree houses to specific requirements of the potential customer. A far cry from the hastily knocked together wooden planks most kids are used to. These will set you back up to £100k and come with features like iPod docks, heating and plumbing. All countries are seemingly after the upper class tree house market. 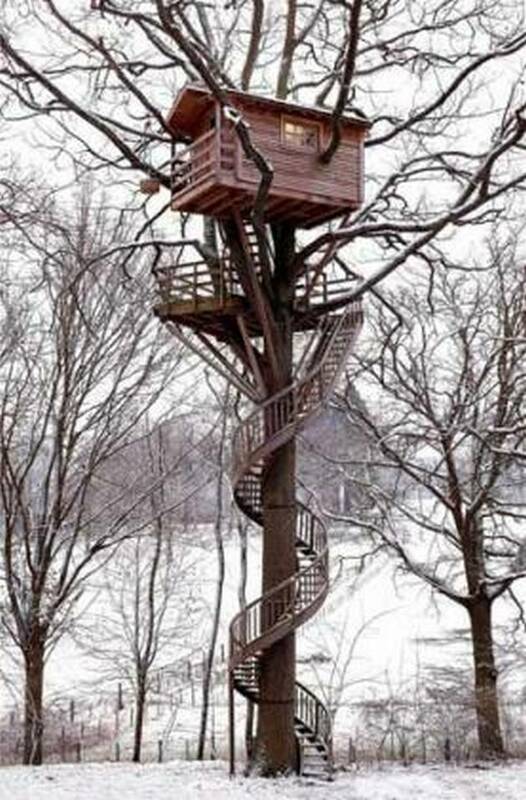 Take French company La Cabane Perchée Designed by Daniel Dafour and needing a rather tall ladder. Sticking with an environmental theme, these buildings often come with solar panels for green power. Wanting something a little more rustic and down to earth? Well, not literally down to earth of course. This one is set among a mature stand including Scots Pine and comes with a hint of luxury but nothing too fancy. One of my favourite designs comes from architect Tom Chudleigh who created the Free Spirit Spheres. These wonderful cedar constructions have an eerie otherworldly look to them. Oriental lanterns such as those traditional Chinese and Japanese affairs inspired Lukasz Kos to design this stunning structure with the dramatic use of light. Attached to four mature trees he calls it the 4TreeHouse. But homes are for living in, not just to be design spectacles. 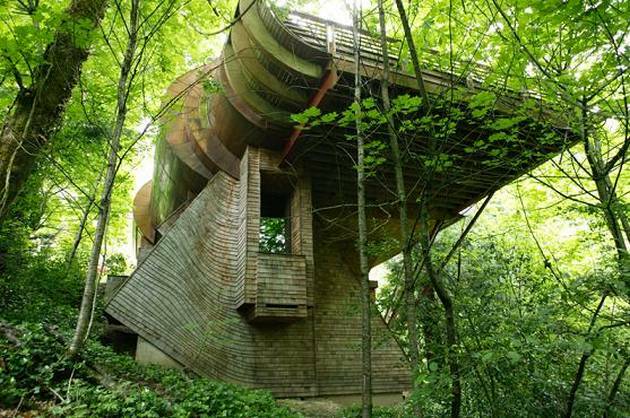 The Wilkinson residence in Portland, Oregon took 7 years to build and is my kind of tree house. Robert Oshatz, the architect, says ‘A lover of music, the client wanted a house that not only became part of the natural landscape but also addressed the flow of music.’ Well, I’m not sure about all that but it sure looks good. Is this a shed high in the air? With a dizzying spiral staircase this arboreal house harks back to a more traditional idea of the tree house. Where is the electric shower, this is what i want to know? 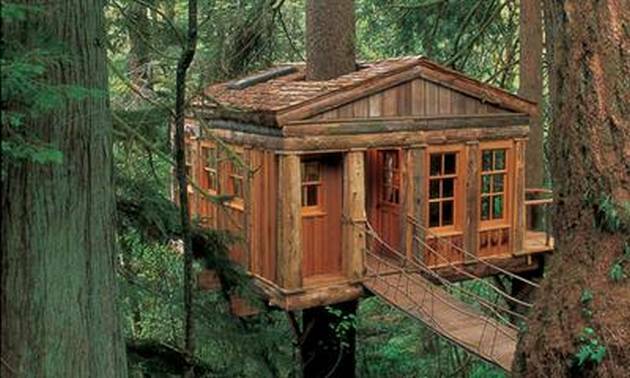 So far I’ve always thought of tree houses having to be made of wood; it just seems right doesn’t it? Well, Andreas Wenning of Baumraum fame has kept wood for decorative interior panelling and left the exterior structure of this Jawa Sandcrawler lookalike to be made of weathered steel. And I couldn’t finish without including this sculptural beauty found in Japan. Outstanding. Talk about cheap bathrooms, all those leaves give me an idea. Anyway i’m off to collect some branches and build myself a home, cheaper than rent in London.